Author caninetutorPosted on February 24, 2018 Categories UncategorizedLeave a comment on And How Does That Make You Feel? Author caninetutorPosted on December 27, 2017 Categories UncategorizedLeave a comment on Engagement: Why the Extremes? As a dog trainer there often comes a point in your work with any particular dog where you realize that focus is a real thing and you don’t have it. You have behaviors on cue and you have a dog that will work for food and/or toys, but you still have a problem. A BIG problem. It feels like you are doing 90% of the work to keep your dog in the game with you. You may resort to bribing and begging and cajoling and cheerleading and acting like a clown on crack to keep your dog interested in training. At this point you need an intervention. A focus intervention. You’ve neglected a key component of your working relationship with your dog, and now you are seeing the fallout. Luckily, it’s never too late to develop focus. Author caninetutorPosted on December 19, 2017 Categories UncategorizedLeave a comment on Got Focus? Is there a difference? or do they both mean the same thing? We all love to be able to go for walks with our dogs and now the sunny days and school holidays are upon us, there are more and more dog walkers about. It is lovely to walk with our friends and to have our dogs get along (the image above shows dogs from 3 different families enjoying a walk together) and that is what being sociable is all about. The dogs are free to interact or not as they wish as the owners walk and chat. Technically, sociable means that the dog is comfortable and relaxed around other dogs, even if they don’t actually want to play with them. Socialisation means that we get the dog used to the world around it and that the dog has a neutral or positive association with every day objects, people and other animals. we do this from puppyhood (but dogs can be socialised as adults) so that they don’t become fearful of any of these things. Somehow, socialisation seems be to being interpretedby incorrectly by dogs owners and they seem to think that in order to socialise their dog, it has to play with every dog it meets. Now, in principle, this doesn’t sound like a bad idea, but it does have the potential for disaster if you they haven’t taught their dog a recall or if their dog is a bully or aggressive and if they haven’t actually taught their dog to come back or to want to come back. and, in many instances, the owners don’t even check that the dog they are letting their dog charge over to socialise with, is actually comfortable with this or whether it is aggressive, fearful or infirm. This can be a recipe for disaster and isn’t socialising your dog; this is allowing your dog to be a bully and a pest (and technically, if you can’t call the dog back, it can be classed as dangerously out of control). When did things change? Why have things changed? What do we really want or expect from our dogs? We know that dogs are a social species, but they are just as happy interacting with their human family as well as playing with other dogs. They can fulfill all their needs for play by playing with their owner. The occasional play date can be arranged with a sociable dog as a treat, but it shouldn’t become more important that wanting to with their owner, otherwise you end up with a dog that just disappears into the distance on a walk and goes and plays (read bullies) every other dog in the park (whether these dogs actually want to socialise or not,; they get no choice in the matter). If you want your dog to play with other dogs, then let him go to a well managed doggy day care centre once or twice a week. That will be sufficient to meet his play needs. Then when you go out and about on your walks, it should be you that is interacting with your dog by playing some retrieve games, some recall games, some hide and seek games, some searching games and many other games that you can play. Your dog will love to hang around with you and play games with you and will not be quite so dog obsessed. 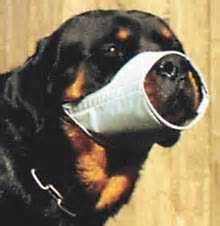 The cloth type muzzles will cause your dog to overheat rapidly because they are unable to pant effectively – dogs can only lose heat by panting (they don’t sweat) so if they can’t get their mouths open and their tongues out, they are in danger of overheating. They also cannot drink effectively. On a warm day, they can get very distressed on a hot day (above 20C), they can rapidly become so hot that they can collapse and die! 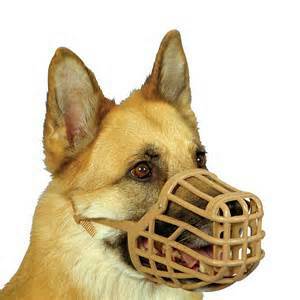 Please do not use the cloth muzzle when walking your dog on a warm day and definitely NOT on a hot day; you run the risk of killing your dog! 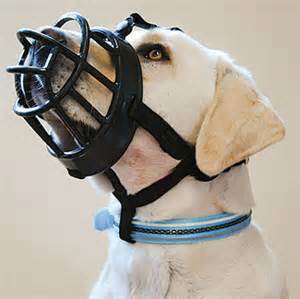 The basket type muzzles (images above) are much better as the dog can pant effectively, can drink effectively and can be given treat rewards easily so that you can reward your dog for good behaviour.